Sports/School Activities: Golf and Student Government. What do you want to be when you grow up and why? Successful! I don't know what I'm gonna do yet but yes gonna be big just watch!!! Favorite song/band: Ed Sheeran is my life!! What is something you are passionate about and why? Student government!! I just feel like there is so much I want to do to change other people's lives! And you don't have to be in student government to change lives but this is a great tool to help!! What is something unique you find central to your personality? Baja blast!!! This week's Hawk of the Week is junior Andrew Numbers. Andrew was nominated by his friends because he always has a fantastic attitude and knows how to make everyone laugh. Being with Andrew brings fun times and he's kind to everyone he meets. Everyone feels comfortable around Andrew and he is a friend to all. Keep reading below to find out more about Andrew, and nominate your friends to be next week's Hawk of the Week! What do you want to be when you grow up and why? Ophthalmologist, corporate defense lawyer, or a businessman. Favorite food: I love all types of food. I'm really into baked goods like cookies or cake but I also like cereal and pasta. Favorite movie: I love Star Wars and watching movies in general. ​What is your favorite thing about Alta and why? 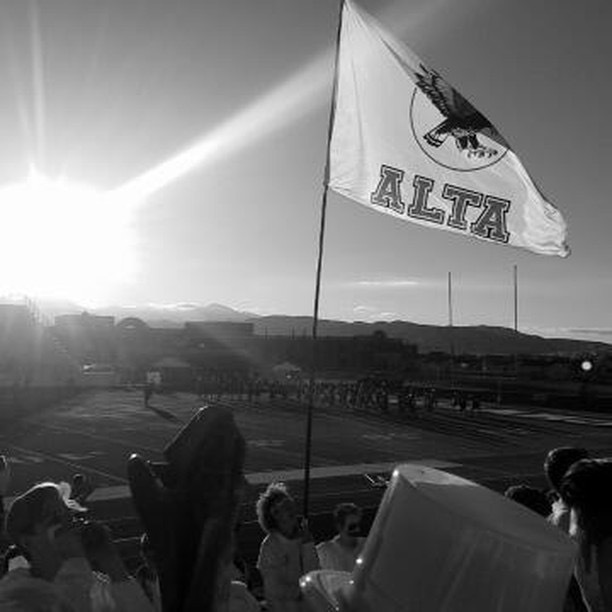 I love Alta and honestly believe it's the best school because of the student. Everyone is so accepting and genuinely nice. 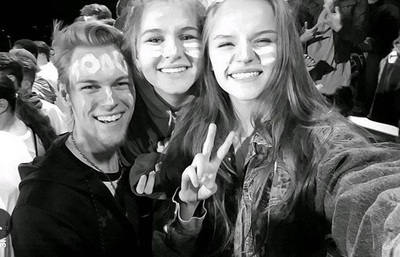 Alta isn't cliquey or judgmental and there's just a general vibe of kindheartedness and acceptance. This week's Hawk of the Week is Alta's very own Traven England! Traven was nominated by his peers because he is a great friend and so kind to everyone he meets. He is known by his friends to be very funny, genuine, and a talented dancer. Traven involves himself in many clubs around school and always puts a smile on his friend's faces! He's very outgoing and can make anyone feel special. Keep reading below to find out more about Traven and nominate your friends on Instagram (@ahshawkeye) to be next week's Hawk of the Week. Sports/School Activities: Soccer and ballroom. What do you want to be when you grow up and why? I've always wanted to be in the field of psychology, I've been leaning towards being a counselor. What is something you are passionate about and why? I've always been passionate about soccer. I've played since I was 5 and haven't stopped since. It's like a whole other world when I'm playing. All I can think about is keeping the ball out of the goal (cause I'm a keeper). There's no stress, no drama, and no work. It's just me the ball, and others who can enjoy playing alongside me. What is your favorite thing about Alta and why? Alta... there's too many things to love!!! But if I had to choose one I'd have to say the students of course. Now I know most people say that, but it's only because it's true. Have you ever sat down and talked with any single student at Alta for more than 1 minute? Try it sometime. They will change your life. I love talking to all the athletes, student government, dance teams, club members, and just the regular students. They are amazing people who strive to make our world better and I love that about them. What is your favorite subject in school and why? I absolutely love ballroom. I never quite knew how much I loved dancing until I took Ballroom One freshmen year. It changed my life. Being able to enjoy one song with one person and just leaving your feelings on the floor is the best thing you can experience. Also, ballroom has allowed me to meet so many crazy, but fun people. You'd be surprised of all the... we'll say... "interesting" people willing to spend one song with you. It's the best. Also, now I'm on ballroom team, so that's how much it has changed me. What is something unique about you that you find central to your personality? Well my momma has always told me that I have a big heart. I absolutely love people. I care about how everyone is doing and I'm always looking for someone to talk to, or to be my friend. I'm not into being "popular" because who needs popularity when you can have genuine friends. Plus, people are the most intriguing species on this entire planet, and I love getting to know as many of them as I absolutely can. What is something no one really knows about you? Well I guess I have two things. First is where my name came from. Most people laugh at the first time the here my name. Mostly because no one can pronounce it properly (it's pronounced with a short A if you're wondering). Well it came from my Uncle Travis. While I was born, he was serving an LDS mission in Hawaii. He was heart broken that he couldn't see me being born. As a gift to my uncle my momma named me after him, but added a little uniqueness just for me. Secondly, I have this obsession with Michael Jackson. He is literally my idol. I have always grown up trying out his moves and learning to moon walk. I casually start singing Billie Jean down the hallways. Also, I dressed as him for Halloween one year. Other than that I think I'm an open book. Thanks for choosing me for this article. 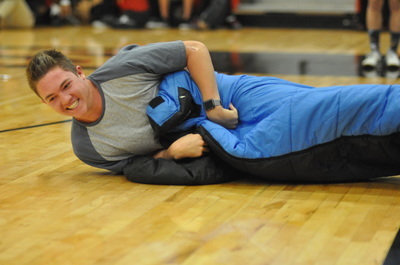 This week's Hawk of the Week is Alta's very own Thane Zeeh! Thane was nominated by his peers because of his work ethic and determination to get things done. Thane is friends with everybody and never hesitates to make someone feel welcome. 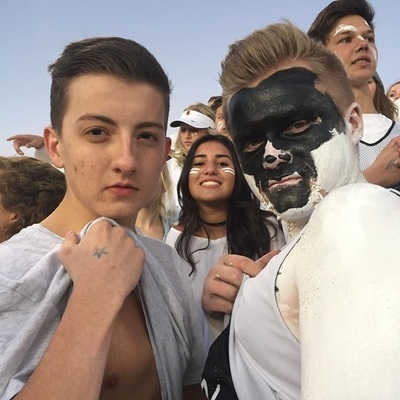 Thane is very passionate about life and inspires everyone to live a life worth remembering, and is also very talented at taking pictures and videos. Keep reading to find out more about Thane and nominate your friends on Instagram (@ahshawkeye) to be the next Human of Alta. Hobbies: Photography, Videography, Coaching Debate, Politics, Philosophy, Entrepreneurship, networking, social media branding. What is something you are passionate about and why? Not wasting time. Because you're gonna die, there's just so much complaining so much cynicism, there's so much 'you got lucky', everyone (not literal), just wants to point at other people, POINT AT YOURSELF, at the end of the day it's what YOU do. How YOU spent your life here on earth. My passion, is to get people to realize this. What is your favorite subject in school and why? Student Government, because a ton of crazy things have happened in it the last three years. What is something unique about you that you find central to your personality? Working, and putting in the 10-20 hours a week into something to make it perfect, willing to be up till 3-4am to finish a video or a album for a shoot for a company. This week's Hawk of the Week is Alta's very own Liz Harrison! Liz was nominated by her peers because of her positivity and optimism, and how she never fails to put a smile on other's faces. Liz is comfortable in her own skin and isn't afraid to make new friends. She always offers a word of advice and never hesitates to help someone in need. Keep reading to find out more about her! Hobbies: I love art, especially performing arts! I spend most of my time dancing and I love listening to, singing, and writing music when I can. I'm very interested in acting and I'm trying to learn how to draw, but both of those are still in process. Oh, and I can't forget taking naps. Truly, that is my best skill. What do you want to be when you grow up and why? I'd like to work in the field of Neuropsychology or Sociology because I love science and I love helping people as much as possible. I think people are amazing, and I'd love to better understand what makes us individuals. I hope to improve how people interact with each other and give others hope in their lives. 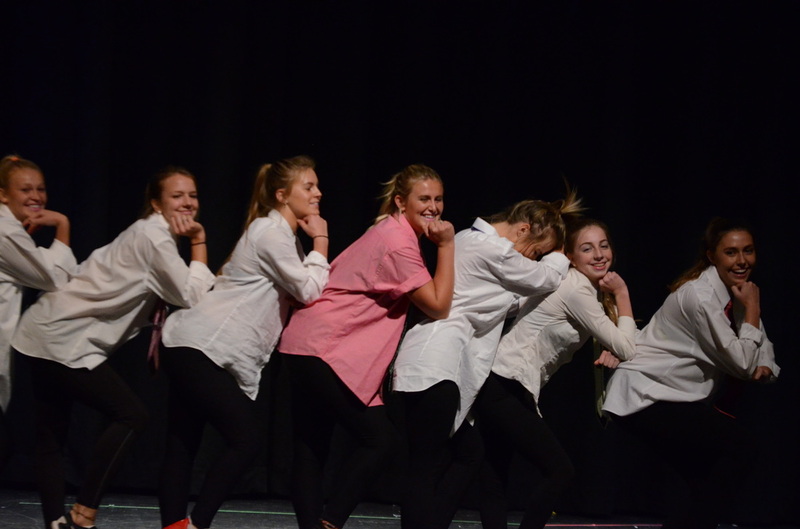 I would also like to continue my love of dance through choreographing. Favorite food: Pancakes. I practically live at IHOP. Favorite song/band: Oh Wonder & Ben Howard are two of my favorite artists. What is something you are passionate about and why? I'm very passionate about service. It's simple and easy, but service changes lives. I feel it gives me purpose and strengthens my relationships with the people around me. Others have served me, so I think it's important for me to give back the best that I can, even if my contribution is small. What is your favorite thing about Alta and why? The people, hands down. They have taught me how to love and accept myself. They make me laugh, cry, and everything in between. I can't thank them enough. What is something unique about you that you find central to your personality? I'm very open about how weird I am. This week's Hawk of the Week is Alta's very own Mia Moore. Mia was nominated because she helps her friends in time of need even during the hardest of times. She is always there to listen and give advice to her friends when it feels like they are alone. She is kind, caring, and a good friend to all. I would like to explore the world. There are so many different people and cultures and I want to see all of it. What is something unique about you that you find central to your personality? Art, because it allows you to express yourself through image or music instead of words. Make sure to send in nominations of friends you want to be featured on "Humans of Alta" as the Hawk of the Week! Held at the South Towne Expo Center, the walls and rooms are transformed into a Christmas wonderland. Adults tickets are sold for $6.00, children's tickets are sold for $3.00, and senior tickets are sold for $5.00 and all of the proceeds go towards to give a "Gift Of Love" to the children of Primary Children's Hospital. The event is held from November 30 to December 4. Held at the Hogle Zoo in downtown Salt Lake, go see the animals in the winter while surrounded by gorgeous Christmas lights. Go with a date, a friend, or family and get yourself in the Christmas mood while experiencing animal's behavior in the snow and cold. Adults are admitted for $8.00, children for $6.00, and seniors for $7.00. The zoo lights open December 1 and continue through the month of December only (closed on Christmas Day). Head down to Temple Square to experience a magical Christmas experience to get you in the Christmas spirit. 35 acres are covered in Christmas lights, decorations, and multiple nativity scenes are placed throughout the square. Free admission to lights as well as free concerts and performances daily. Held at the local Draper Park, the annual tree lighting ceremony for the Tree of Life is Monday, November 28 with free admission. The Tree of Life is set at the center of the Draper Park and surrounded by multiple colorful lit trees in the park. You can walk down the trail in Draper Park and experience a winter wonderland in a local neighborhood setting minutes from your home. Go meet and hang out with live reindeer freely walking around Thanksgiving Point. From November 28 to December 23, from 12:00-10:00 (Monday-Friday) and from noon-12:00 (Saturday) with no admission cost and lots of fun. ​Have you been to the Hawks Nest this year? Whether you’re coming for a Cup of Noodles or some hot chocolate, there is something at the Nest for everyone. The Nest is run by 24 qualified students and Ms. Allen. “The teacher is phenomenal!” exclaimed Zachary Maas. “She deserves a pay raise.” If nothing else, students can enjoy going to the Nest just to see Ms. Allen. Besides having the best teacher, the Nest also has reasonably priced food, Alta wear, and other little things. The most popular item being gum for cheaper than grocery store prices, and the most profitable item being Cup of Noodles for only $1.50. And it is open both lunches for the majority of the year making it very accessible to all. 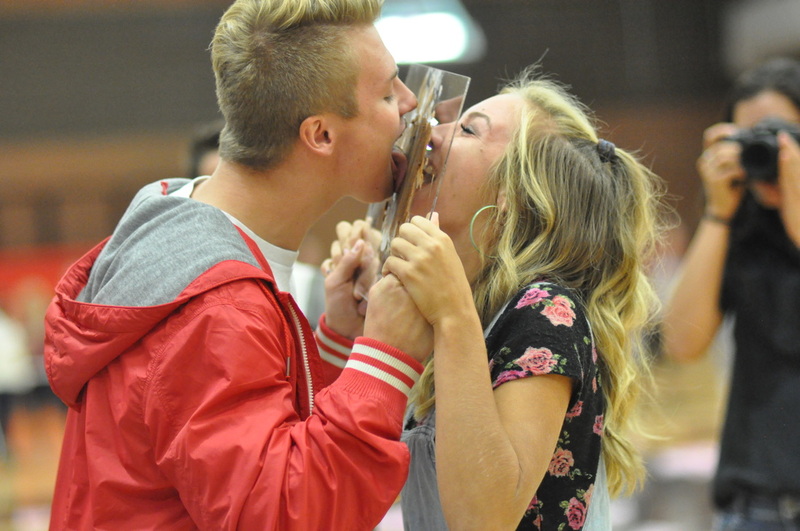 What motivates these students to sacrifice their time for the students at Alta? Armany Levine says it’s because he “likes to make people smile”, while Alec Groathouse likes “meeting new people”. The students working at the store enjoy having both lunches and getting paid in food. If working at the school store interests you, students can apply to be part of the upcoming years staff in the Spring. Whether you work at or you purchase items from it, the Nest is a place for everyone to enjoy. 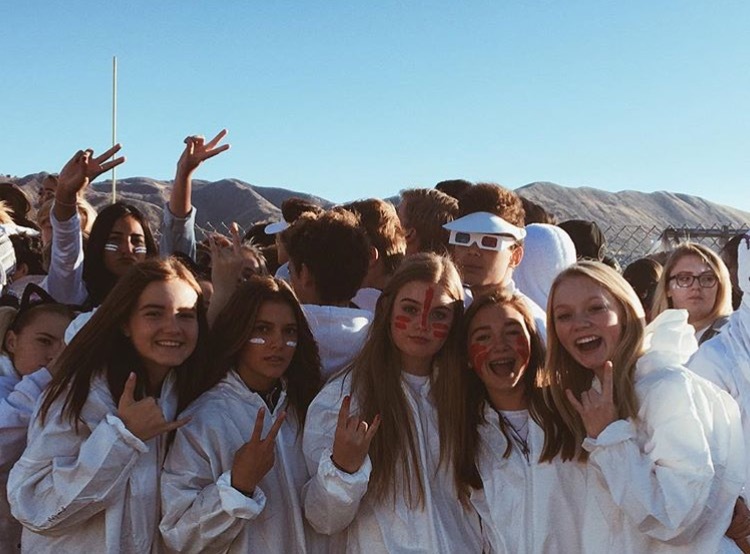 On October 19, 2016 the Alta Hawks faced the Corner Canyon Chargers on Corner Canyon's homefront, and although the game ended in a loss for the Hawks the student section couldn't have been better. The night before the game, the Corner Canyon student section decided to burn the Alta flag and football jerseys in order to try to defeat school spirit. However, it did the opposite. 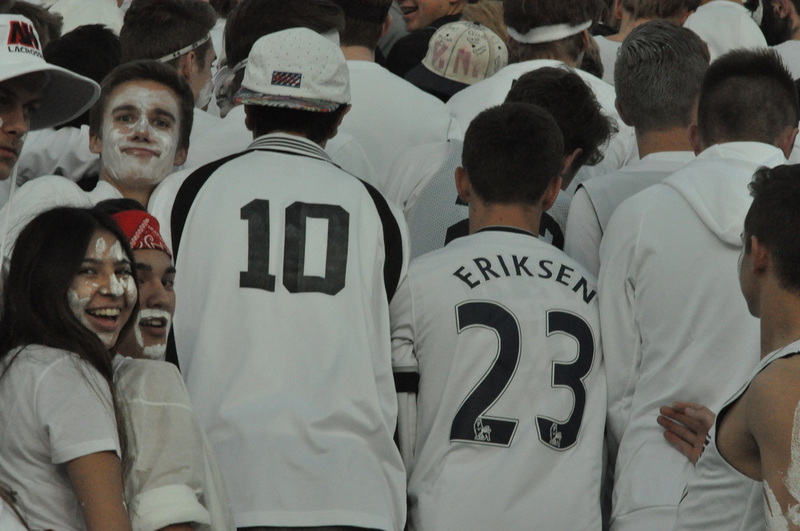 Students showed up as early as 3:00 pm before the football game to show their support for the football team. Students went crazy with facepaint, white clothes, and trumpets in order to make their voices heard. (Photos above credited to @elle.tracyy and @zmoney_2035 on Instagram) Isaac Johnson even pierced himself before the game started and got the crowd going wild. 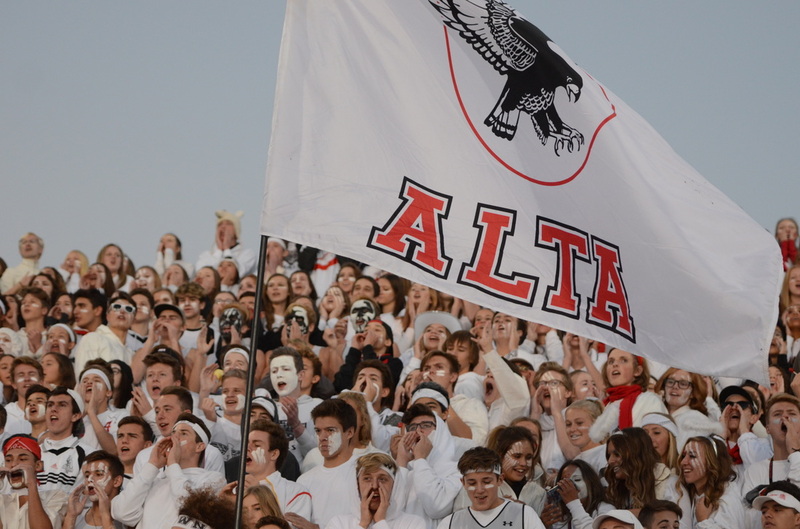 Although Corner Canyon burned things before the night before the game, the Alta flag was in the student section held by Riley Wooden to unite the crowd. 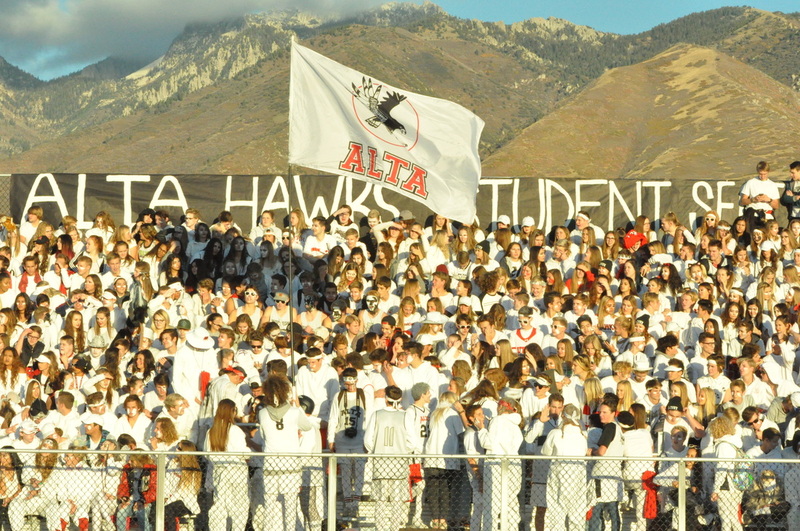 The Alta Hawks prepare for the football playoffs beginning this Friday, October 28 4:00 against Wasatch at the football field. 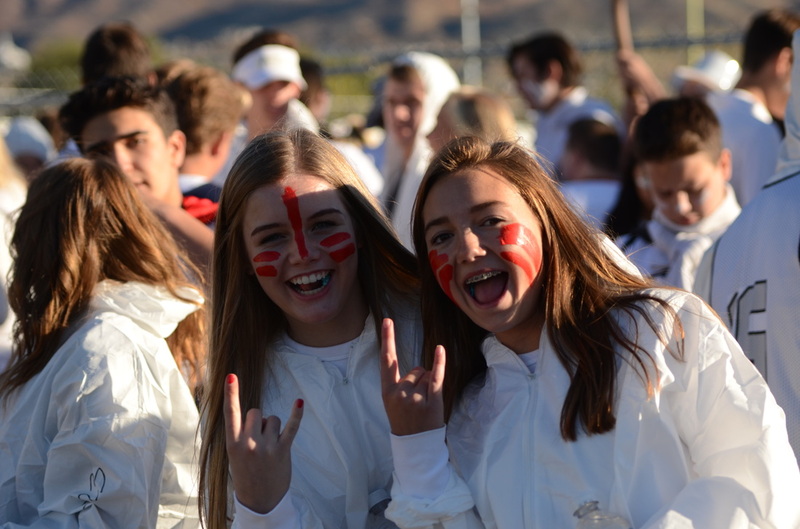 Also make it out to the volleyball game at Timpview Tuesday, October 25 6:00. During advisory time, Alta held its annual Homecoming Assembly. During this time, students experienced games, relays, performances from the fine arts teams (such as Dance Comapny, Ballroom, and Drill), and ended the excitement with the school song. 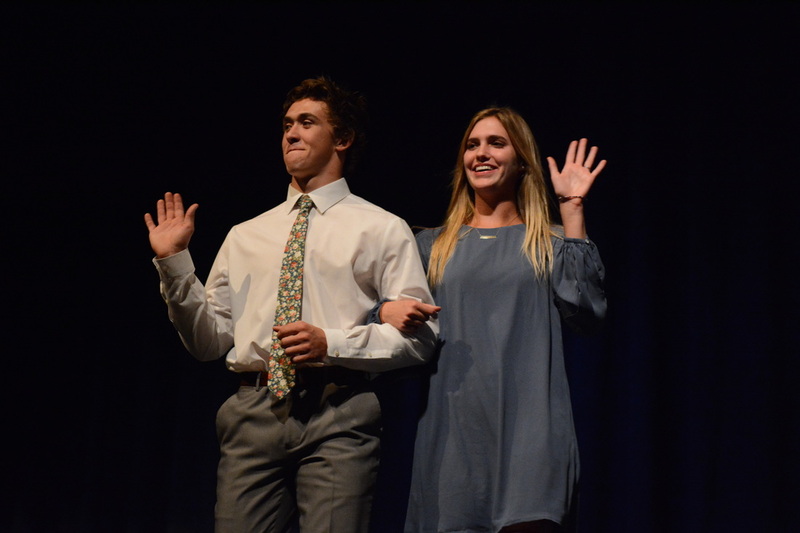 But the excitement didn't end after the assembly, and continued on to that night for the Homecoming Pageant. Josh Davis, Megan Bain, Hailey Tuttle, Dallan Ashdown, Sadie Mertlich, and Vinny were the runners up for the Homecoming Royalty. 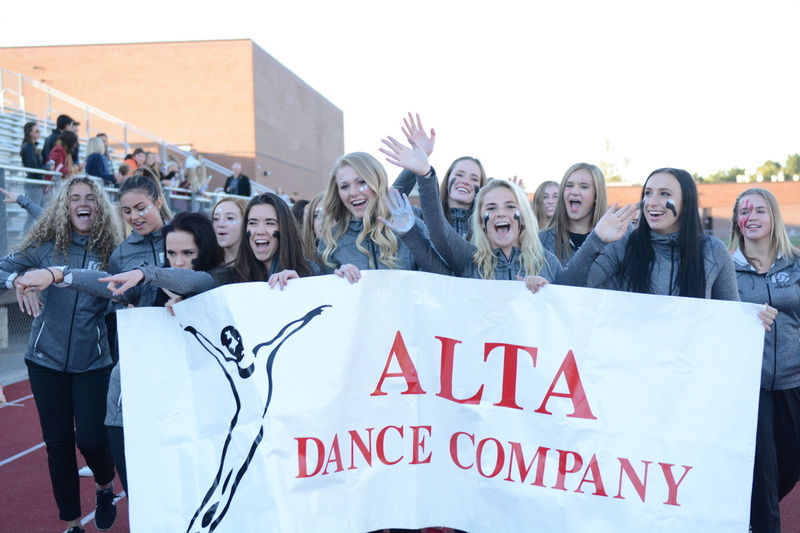 Students came together to the football field at 6:00 to watch the parade consisting of the clubs available at Alta High School. 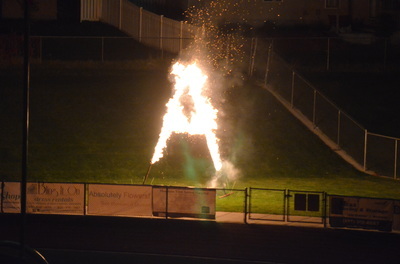 After that concluded, students engaged in a series of games against the different classes, and ended the night with fireworks and the annual tradition of the burning of the A. 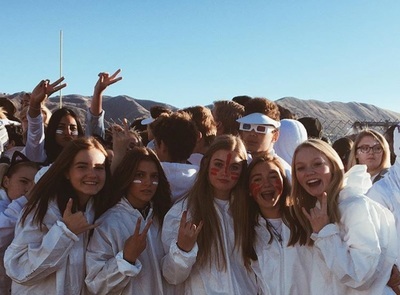 The week was concluded by a victory for the football team over Provo with a final score of 56-36. 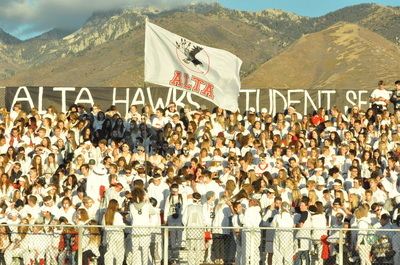 The Alta Student Section was decked out in black and filled to the top of the bleachers in order to cheer on the Alta boys. 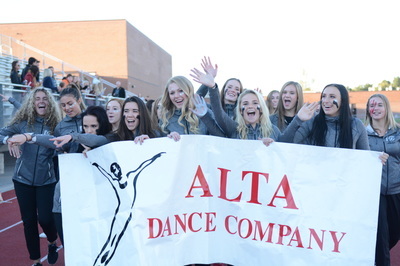 The halftime show was spectacular due to the performances from Dance Company, Drill Team, and Alta Ballroom.